Some rural social activities were somewhat lost a few decades ago, but there is a renaissance to bring them back. They sometimes return with an even more sustainable and visionary twist while remaining steeped in tradition and closeness to the land and seasons. 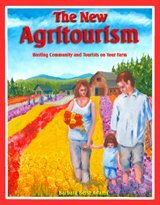 While researching both of my eco-farming books Micro Eco-Farming, as well as The New Agritourism: Hosting Community & Tourists on Your Farm, many interviewed folks -- as well as readers who wrote to me after publication -- talked about the sense of community they gained from starting their small farms. Bonfires: Rural backyard firepits and campfire cooking -- eco-friendly and fun!